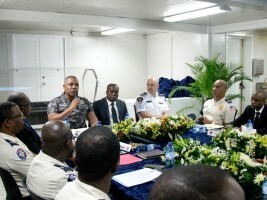 As part of the Implementation and Monitoring Committee (COMOS) in order to prepare for the end of the mandate of Minujusth and the transition towards the end of peace operations in Haiti, the Joint Directorate of Strategic Planning of the National Police of Haiti (PNH) brought together representatives of international cooperation among others from the United States, Canada, France, the European Union and the Bahamas, and members of the Haitian Government around the balance of the first year of its 2017-2021 Strategic Development Plan (SDP). One way to sensitize these actors on the financing of this institution guarantor of public security in the country. Michel-Ange Gédéon, the Director General underlined the excellent collaboration of the Minujusth and recalled that the sustainability of the progress made during this first year by the PNH, depended as much on the political will of the Government as the financial support of the donors on funds. A clear message sent by the Haitian police to the members of this first COMOS of the year, which should meet again in May 2019 to determine the modalities of their cooperation.